Angela Perkins relaxes during the final episode of "Survivor: Ghost Island"
Angela Perkins of Oregonia made it to the final four on "Survivor: Ghost Island," losing the last challenge which could have put her in the final three for the $1-million prize. Perkins lost a fire-building competition to Wendell Holland, 33, a Philadelphia furniture maker who won the reality show's cash prize. 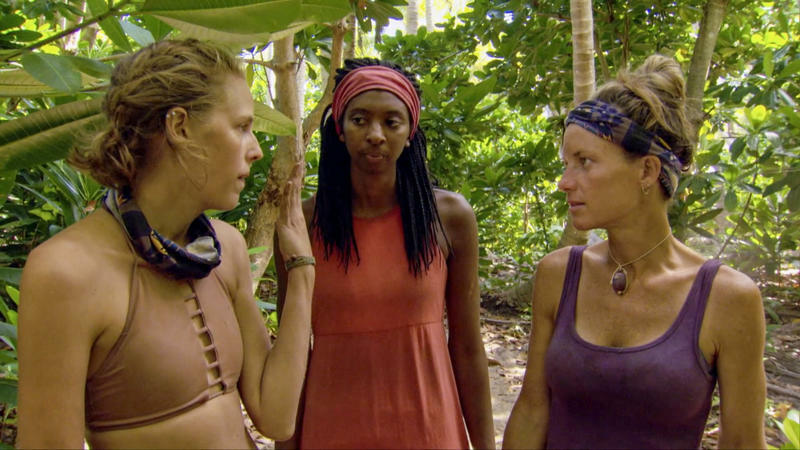 In an unprecentended move, the last tribal council with three finalists ended in a 5-5 tie between Holland and Domenick Abbate, 38, of New York. So the deciding vote was cast by the third finalist, Laurel Johnson, 29, also from Philadelphia. She said Wednesday night that her personal relationship with the fellow Philadelphian was the reason she made Holland the winner. Earlier in the show, Perkins failed to win two immunity challenges. 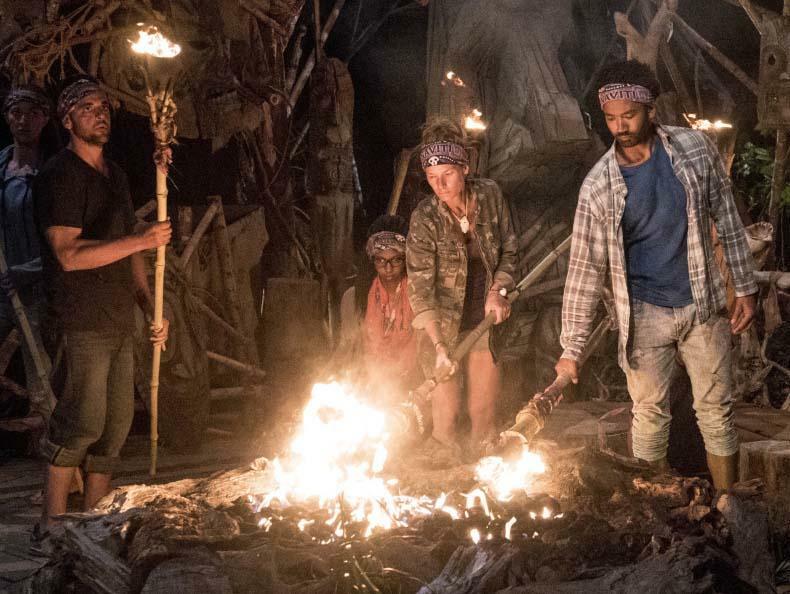 Wendell Holland (right), the "Ghost Island" winner, lights his torch on the second episode from March 7. To Angela Perkins' left is Domenick Abbate, who finished second, and behind her is finalist Laurel Johnson. "I made it this far, so I'm proud of myself, but my goal was to win," she said after her exit. "So while I believed in myself, it's very hard for me to accept that I failed. Obviously, everybody comes out to win – but there's only one winner." At 42, Perkins was the oldest of the 20 contestants who taped "Survivor: Ghost Island" in Fiji last summer. 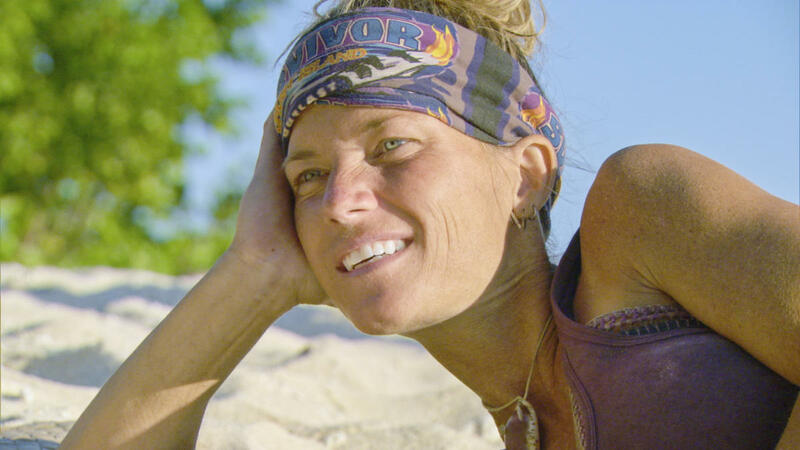 Throughout the season, including Wednesday's finale, she mostly flew under CBS' radar, winning only one immunity challenge in 13 weekly episodes. 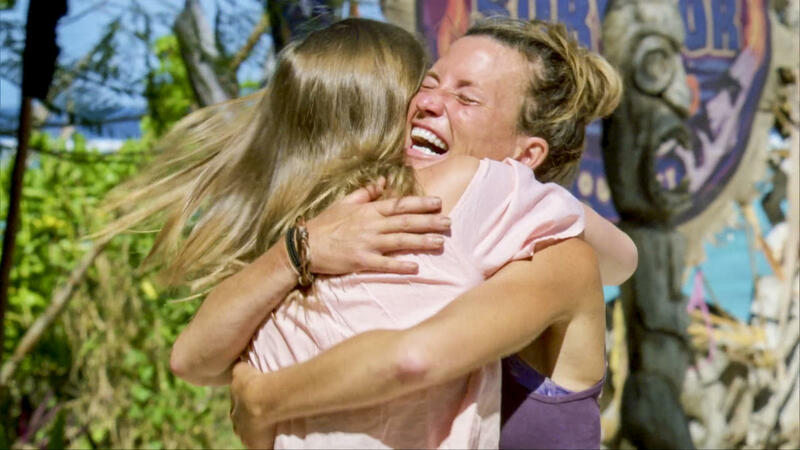 Angela Perkins celebrates her only immunity challenge win on April 18. A Michigan native, Perkins told me last week at her Kings Mills viewing party that she wasn't seen much on TV because "they want the drama." That was provided by many strong personalities on the show, including Wendell, Domenick and Laurel. Perkins served 21 years in the Army, retiring as a captain after deployments to Iraq (2003-04) and Afghanistan (2011-12). After the Army, she divorced and rented an apartment, "giving up my dream home to my ex and everything we worked for just for the opportunity of being on 'Survivor,' " she said. "When you're going to war, you have to rely on the man next to you to have your back regardless. If you're in the foxhole, and you know you're getting ambushed, somebody has your back. On 'Survivor,' if you're in the foxhole, and you get ambushed, you're probably getting ambushed by the guy who's sitting next to you. So it's quite different." Angela hugs her daughter on the May 9 episode. Perkins works from her home in Oregonia, in rural northeastern Warren County near Fort Ancient (her CBS bio said she was from Mason) for the U.S. Department of Veterans Affairs. Her son, 20, who attends Cincinnati State, calls her "an American badass." She also has a daughter, 22, in nursing school near St. Paul, Minn. Both are graduates of Clinton-Massie High School. Sitting around the camp on Fiji. On the May 9 episode, Perkins wept tears of joy when her daughter visited her on Fiji. She told me that the emotional experience turned her "legs to jelly," making it impossible to compete in an immunity challenge. She finished last.